Do you prefer the look and feel of wire binding, but don't have a wire binding machine? These Spiral-O wires are made to work on plastic comb binding machines, since they need 19 holes, and a wire closer. These wire binding spines can hold anywhere from 40 to 200 sheets of 20lb paper, ranging from 1/4" to 1" thick. And black is a classic color for office and professional document binding-it compliments every color! Get binding today with Spiral-O! Welcome to MyBinding video. 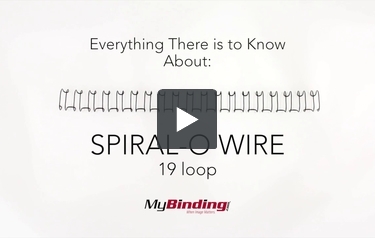 This is everything you need to know about Spiral-O Wire. There are sizes ranging from 1/4" to 1". They can hold up to 200 pages and everything in between. They come in a standard 11” length. Spiral-O has a 19-hole punch pattern, which means it works with the same holes used for comb binding. A nice feature is that they lay flat, but better than that pages lay back to back. Though you can use a comb binding punch, you will still need a crimping machine to close and finish your book. Here is a look at the 2 main types of pitch for twin loop wire and a look at the 19 loop Spiral-O wire. Lastly, they only come in a few colors. And that is Spiral-O wire. For more demos, reviews and how-to’s, go to MyBinding.com.